If you're considering going to the field this week to start planting, be sure to check predicted temperatures for the critical 48 hours after planting as well as average soil temperatures for the previous seven days to avoid germination problems. Corn seed is very sensitive to soil and soil water temperatures below 50°F during the first 48 hours after planting. This is when water rushes into the seed to rehydrate the cells through a process known as imbibition. If temperatures are below 50°F, cells can rupture, which can lead to nonviable swollen kernels and aborted growth of the radicle (root) and coleoptile (shoot). Cold temperatures will interfere with proper hydration of cell membranes and could lead to chilling injury and reduced yield. When temperatures remain above 50°F for the first 48 hours after planting, seeds can be expected to germinate. If the soil temperature dips below 50°F after the imbibition period, it usually isn't an issue as the seed will be taking in water through a slower process known as osmosis. With cooler temperatures germination will be delayed, but should occur. Cold stress also can occur in soybean if the soil temperature falls below 50°F during the first 48 hours after planting. The germination stage of soybean consists first of a very fast uptake of water (imbibitional phase) followed by a much slower uptake of water (osmotic phase). Chilling during the first phase can cause severe problems because the imbibed water is needed to rehydrate the cotyledons and embryo to the point that cell membranes become functional. Cold temperatures interfere with proper hydration of those membranes. The imbibitional phase typically is not very long (less than 24 hours) and can occur with relatively little soil moisture since the seed is dry. Thus, getting a cold rain 0-24 hours after you plant can lead to chilling injury in soybean and lower stands. A study by UNL researcher W.J. Bramlage et al. showed that when the soybean seed coat was removed, imbibition injury occurred within 30 minutes. With a seed coat, imbibition is slower and a longer exposure would be needed before chilling injury occurs. A key point to consider is that chilling injury is likely to be greater if soil temperatures were cold (conservatively, less than 50°F) at planting rather than becoming cold 24 or more hours after sowing. (The 50°F threshold is a change from previous CropWatch articles that listed 40°F as the injury threshold for soybeans during the imbibition stage.) The longer the seed is in the ground at warm soil temperatures before cold temperatures occur, the less likelihood there is of chilling injury. The bottom line is: You can consider planting soybeans if you think soil temperatures won't get cold (less than 50°F) for at least 24-48 hours after planting. If you planted two or more days before the cold rain, there should be no imbibitional injury due to cold temperature. Check the average soil temperatures for the last seven days. Check the air temperature predicted for your area for the next 48 hours after planting. Note that soil temperatures, particularly in wet soils, change more slowly than air temperatures. 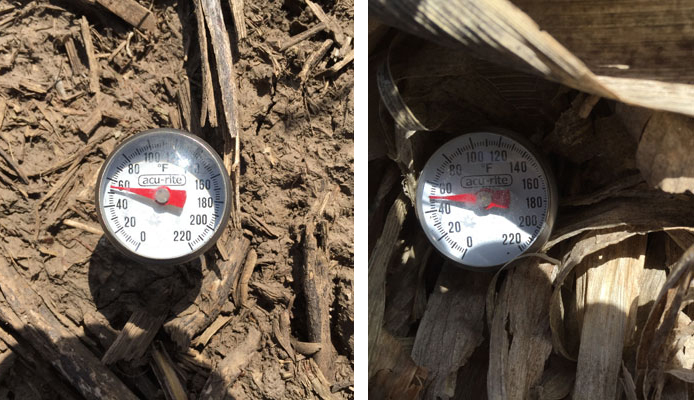 Test the soil temperatures in your field. Get a thermometer with a probe (for example, a meat thermometer that's kept for soil tests). On the day you'd like to plant, take a reading just after dawn — this is the coldest period during a 24-hour timeframe — to determine today's soil temperature. If the results of these tests indicate soil tests are currently below 50°F or are expected to drop for much of the 48-hour imbibition period, consider delaying planting. Wait until you feel confident that soil temperatures will be above 50°F for the 48 hours after planting.